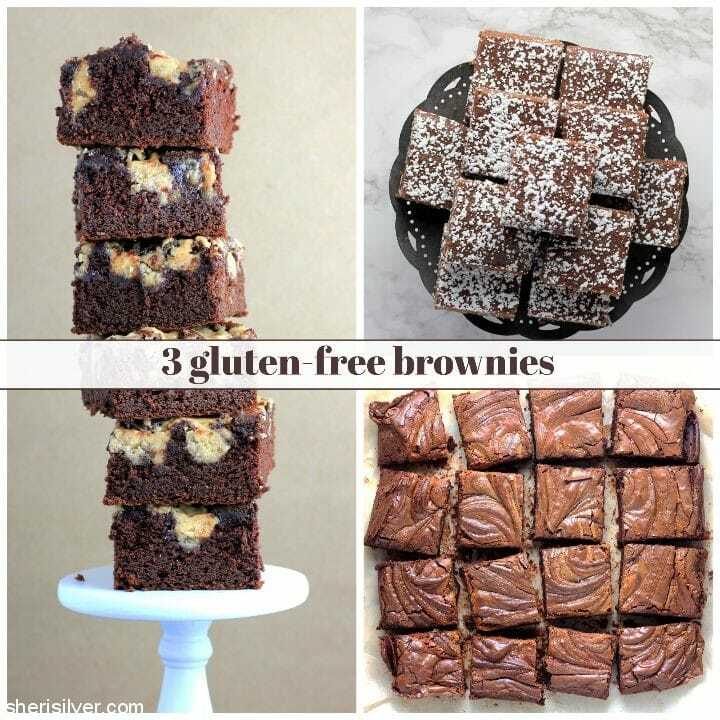 3 gluten free brownies for you! For the month of March I’ll be sharing a flourless recipe each week, to enjoy during Passover! B) I already have several brownie recipes in my life (and on this blog – classic, vegan, ice cream sandwich and even Milky Way). Did I need even one – not to mention three – more? I’m going to leave that up to you, with this super-sized blog post! It started innocently enough, when I came across a recipe for GF tahini brownies on The Nosher. Passover was already on my mind, and though I knew that for some, tahini and halva would not work (see Note, below), I had to give them a try. See, I’ve become a bit obsessed with tahini lately, and some of you may remember that my very favorite doughnut these days is the halva version from Underwest. Verdict? 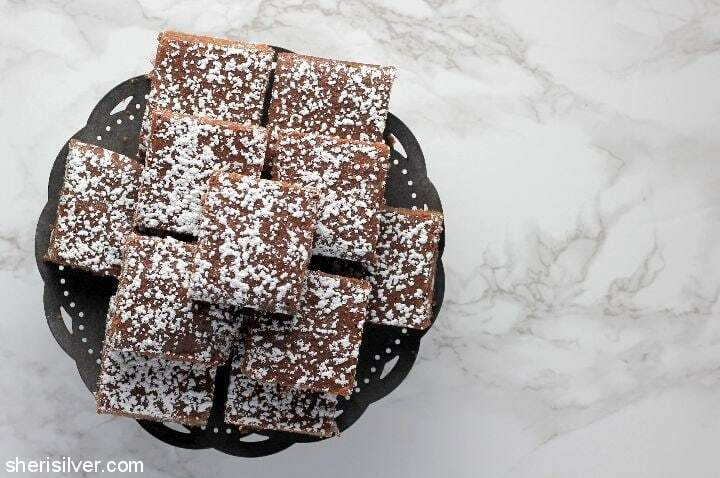 They were very good – the sweet/savory/crumbly halva was an amazing addition to the rich brownie batter, the recipe came together easily and successfully, and you’d never know they were GF – the texture was perfect (as you can see). The only “miss” was the tahini swirl – I would have wanted it a bit sweeter. These beauties from The Kitchn. I was very intrigued by this Paleo-friendly recipe because – given that they were dairy-free, flourless AND void of kitniyot* – they’d be A-OK on anyone’s Passover table. Verdict? Let’s start with how easy these were. Like, one-bowl-five-minute-prep easy. Just a handful of simple ingredients (I omitted the chocolate chips; feel free to add them if you like) and they were baking away in the oven. Texture and taste were spot-on, and the quick and easy process ensured that I could whip these up on the regular – and all year long. 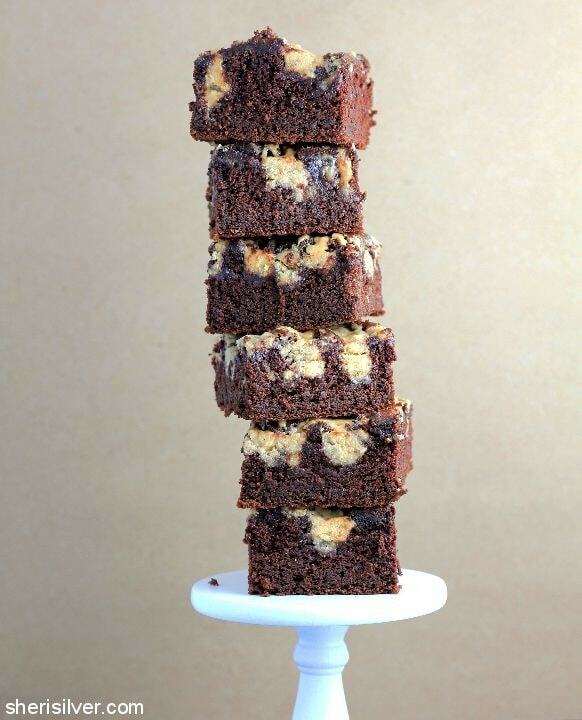 I had already bookmarked yet another GF tahini brownie recipe in my recent issue of Bon Appetit. I wanted to try it and compare to the earlier version I’d made, but never got around to it. When a fellow blogger posted them on Instagram and raved, how could I not? Verdict? 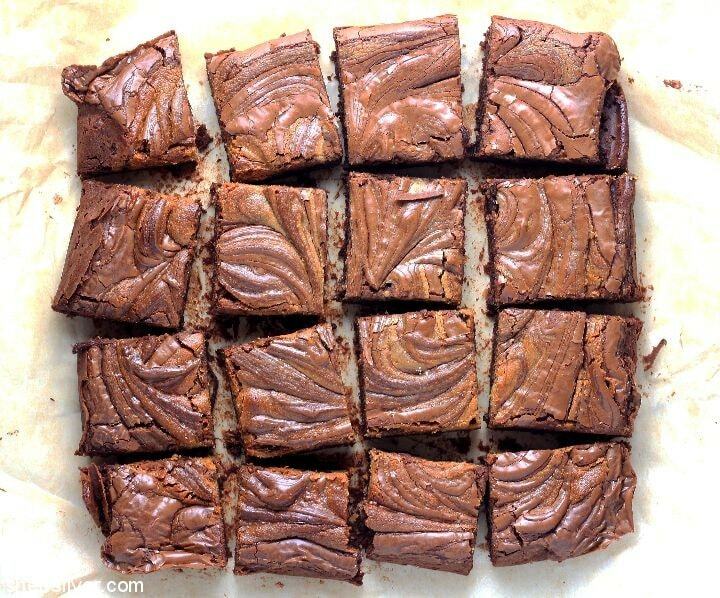 By far the closest in texture to a more traditional brownie. They took a smidge more time and effort, but nothing to shy away from, I promise. If “cakelike” is more your thing you’ll probably like these the best. I was also a fan of sweetening the tahini for the “swirl”; this definitely improved the flavor for me. I would encourage you to try all 3 of these recipes yourself (they’re easy enough!) and see which you like best. As for me, I’d like to experiment with those Paleo brownies, adding the sweetened tahini and chopped halva on top – for the best of all worlds. I’ll let you know how they turn out; please let me know which recipe is your fave! Pre-heat oven to 350 degrees; grease an 8″ x 8″ baking pan or line with parchment paper. In a small bowl, stir 1/4 cup tahini with 1 – 2 tablespoons maple syrup. Place remaining 1/2 cup tahini, remaining 1/2 cup maple syrup, eggs, vanilla and vinegar in a food processor. Process till smooth. Add the cocoa powder, salt and baking soda and process again. Transfer batter to your prepared pan and drizzle with the sweetened tahini, followed by the halva. Bake for 20 minutes and cool completely in the pan on a wire rack. Refrigerate overnight and cut into squares. Pre-heat oven to 350 degrees; grease an 8″ x 8″ baking pan or line with parchment paper. In a large microwave-safe bowl, melt the coconut oil. Cool slightly and whisk in the honey and eggs till smooth. Add the coconut flour, cocoa powder and salt – whisk again. Pour batter into your prepared pan and sprinkle with chocolate chips if using. Bake for 20 – 25 minutes or till firm to the touch. Cool in pan for 10 minutes, then remove from pan to cool completely on a wire rack. Cut into squares and serve. Pre-heat oven to 350 degrees; grease an 8″ x 8″ baking pan or line with parchment paper. In a small bowl, stir 4 tablespoons tahini with 1 – 2 tablespoons honey or maple syrup. Whisk cornstarch and cocoa powder in a medium bowl; set aside. Heat chocolate chips, coconut oil, and remaining 1 tablespoon tahini in a small saucepan over low heat, stirring till melted and smooth. Beat eggs and both sugars in a mixer on medium-high speed, till doubled in volume (about 3-4 minutes). Beat in salt and vanilla, then beat in the chocolate mixture till incorporated. Beat in the cornstarch mixture, then increase speed to medium-high and beat for about a minute more. Pour batter into your prepared pan and smooth the top. Dollop the tahini mixture over the top and swirl with a skewer or toothpick. Bake till a tester comes out with a few moist crumbs attached, 20 – 25 minutes. Let cool completely before removing from pan and cutting into squares. Check out my Passover and Wheat-Free Pinterest boards for more delicious ideas! **Note: Many Jews abstain from eating what is known as “kitniyot” during Passover. Kitniyot includes legumes, beans, peas, rice, millet, corn, and seeds.